Look who swam into the shop! We are thrilled to introduce the latest additions here to The Gilded Lily: The Chic Chinook, The Tawdry Trout & The Queen Cod—Three fish ladies that are joining us for the summer. Together, these three have made quite the journey and are taking a moment to slow down here for the season. They’ve swam through every corner of the shop and perched themselves right into our north window—fashionably dressed in a few of our summer favorites, of course. This aquatic group of gill-bearing ladies are making quite the splash this summer with their boisterous personalities and fun attitude. We hope you'll stop into the shop to say hello and join in on all the fun. A special thank you to Sara Hasslinger, the talented artist behind these fantastic papier-mâché heads. Sara started Monsterlove (her studio, which is now located in Chelan, WA) in 2002 as a community art project to spark creativity and help participants see different perspectives through creating, then wearing the papier-mâché heads. We are thrilled to have Sara’s work on display here at The Gilded Lily Home and will be featuring another group of her work soon. Pantone has announced Ultra Violet as the 2018 Color of the Year. “A dramatically provocative and thoughtful purple shade”, Pantone’s color exports forecast this color that “communicates originality, ingenuity, and visionary thinking that points us to toward the future”. Left Image: Elle Decor. Right Image: House Beautiful. We’ve certainly started to see this bright shade swooping across fashion and home decor as of late and it seems it’s only the beginning. While reaching for paint to dress your walls in Ultra Violet might be too far for some, we’ve put together a few home accessory accents in the Ultra Violet hue from our shop that you can easily add into your home this season. 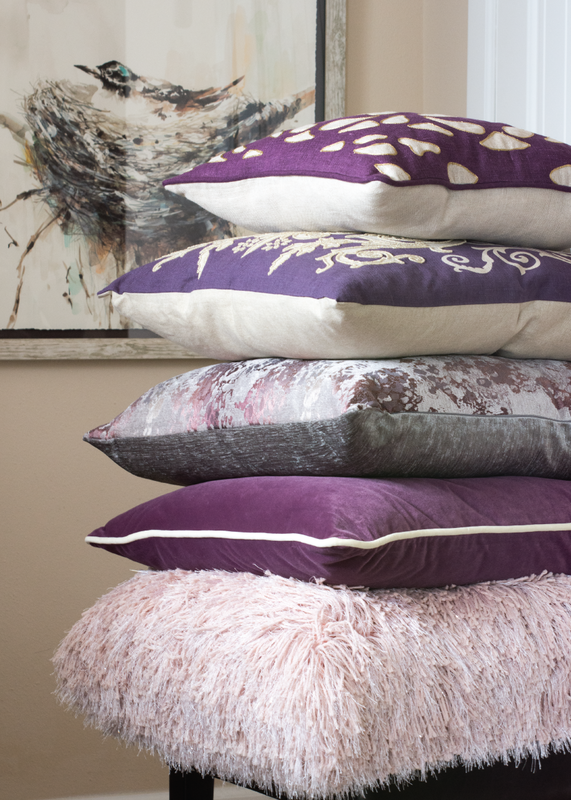 Shop our collection of throw pillows in Ultra Violet as well as many other beautiful colors. From solid velvet to tonal patterned poufs, a few new throw pillows can add a fresh new look to your home. Adding in 2018's Ultra Violet into those cushions—even better. If you're looking for more subtle ways to add the color of the year into your home, decorative candles are your answer! Our collection of Vance Kitira handcrafted candles bring the tonal colors of Ultra Violet in your home to life. Style a few together for a statement on your dining or coffee table. From your sister to grandparents and your best friend, there are so many different personalities to shop for this time of year. We've gathered 10 fun gift ideas with those of differing tastes in mind. See something you like? Feel free to contact us and we can help you complete your gifting through our personal shopping services. Gift them fun and stylish winter accessories. From wool and felt hats, to leather gloves and warm scarves you can’t go wrong this time of year with the gift of warmth. With a wide selection of styles, you will be sure to find the perfect winter accessories they’ll love. For the people on your list that love to cook. And those that have the best tools for their tabletop and serveware collection we have a wide selection of Laguiole French Knives. Made in France, these knives are 100% handmade workmanship. From steak and bread knives to “Peel and Pare” sets and more these make such a special and unique gift. Let the gift speak your sentiment with our collection of Mudpie. Each serving piece has a small witty phrase making them such a fun gift. Pair them with a few of our specialty food items and you’re all set. We love the Mudpie Bloody Mary pitcher, “You say tomato... I say Bloody Mary” gifted with our Bloody Mary seasoning, pickled asparagus and a fun kitchen towel to give a well rounded and thoughtful gift. For the people on your list that like to “see clearly”. We have a wide selection of Eyebobs eyewear that will step up their readers with bold and unique styles. Brand new to the collection is the Sticky Business style—these readers come with a magnetic polarized lens that easily attaches to the glasses. From inside to out they’ll be able to read clearly with ease. Give the gift of wonderful home fragrance from Lafco NY. From their beautiful glass vessel candles to diffusers, soaps and lotions this line of home fragrance is simply divine. We carry a wide selection of their fragrances so you can select the right scent for each person on your list. Do you have a few people that are a little harder to shop for? We all have those certain ones on our list. Choose to gift them a priceless memory or family photo beautifully displayed inside a frame from our collection of Michael Aram and Beatriz Ball. Whether it’s for the grandparents or for your dad’s office, these frames display those precious photos in a stunning and elegant way. For that very special someone on your list. Browse through our jewelry and choose something truly unique from our Estate & Vintage Jewelry collection. From one-of-a-kind rings, to precious gems in earrings, bracelets and necklaces any piece from this collection is sure to surprise them with a very special sentiment. For the women in your life. You cannot go wrong with gifting them a fun new handbag. From patterned Spartina 449 to structured leather pieces from The Leather Satchel Co. we have a wide variety of handbags to match their personality and style. For those on your list that love to entertain and host company. A beautiful piece from Beatriz Ball might just be the perfect gift. 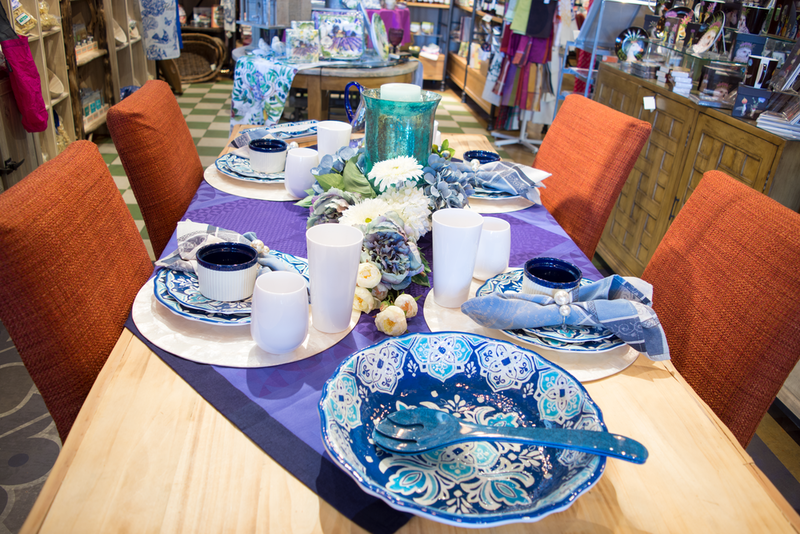 These pieces are a wonderful accompaniment to their serveware and is made from 100% recycled materials. Each item can go from the freezer to the oven safely and won’t tarnish. From ice buckets, to serving trays, bowls, platters and more, a Beatriz Ball gift will make such a wonderful statement. A gift card is always a good idea. And in the end, if you’re still unsure of what to get that one person on your list, a gift certificate is your answer. We’ll wrap it nicely in our signature gold box and even tie a ribbon on it. It never fails—the gift of shopping will be received with joy! Jaipur, known as the “Pink City” in India for its iconic rose-toned architecture, is the muse and inspiration behind the jewelry line, Jewels of Jaipur. Dallas-based founder, Pat Ryan became attracted to the rich heritage of the region and long-standing tradition of colorful adornment. Travels to the beautiful and unique region sparked the inspiration for the jewelry line in 2013. With stunning earrings and bold statement rings, intricate-detailed bracelets and necklaces, The Gilded Lily Home is delighted to showcase a wide collection of hand selected pieces from Jewels of Jaipur. Ryan regularly travels to India to source the designs of the intricate details, colorful stones and unique forms that are built into every piece. From layering bracelets to stand-alone statements, Jewels of Jaipur is one-of-a-kind artistry. The line is handcrafted with a wide array of rich materials from diamonds to semi-precious stones. Whether styled to accompany a bold ensemble or add a unique finishing touch for the minimalist at heart, each earring, necklace, bracelet and ring is what the brand entitles "wearable art". These east meets west, creative pieces quickly become a go-to favorite in any wardrobe. From layering additions to stand-alone statements, Jewels of Jaipur encompasses one-of-a-kind artistry. Shop the whole collection in person at The Gilded Lily Home in downtown Wenatchee. With our wide selection of eye-catching earrings to striking rings and stunning bracelets, there is something special in store in every Jewels of Jaipur item you take home.